Once and For All by Sarah Dessen was one of my most anticipated reads for 2017, and I’m thrilled to have finally read the book. Earlier this Summer I decided to start my very own Sarah Dessen Readathon, as a way to read all of Sarah’s previous books before starting this new one, as most of the books are connected in some small way, and there were a few of her books that I hadn’t yet read before. I enjoyed reading/rereading these books so much, and I’m thrilled that I have now read ALL of Sarah’s books! 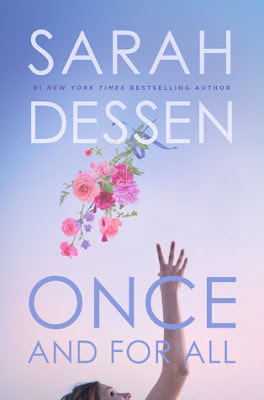 Once and For All was definitely a great addition to my much loved Sarah Dessen collection. There are so many characters in this book to love, and like with a lot of Sarah’s previous main characters, I was able to relate to Louna in SO many ways. I really loved Louna, and her story was both sigh-inducing and heartbreaking as well. All she basically has for her family is her mom, who is awesome, and her mom’s best friend, William, who is practically her father figure. I loved them as well. But it was definitely Ambrose that stole the story for me. How could you not love Ambrose?! His incident with the tape dispenser was one of the most hilarious parts of the story, but there’s so much about him to love. Read the book and meet these characters for yourself, and I know you will love them as well. I was super excited about the storyline of the book. I love a good wedding story, and with this being about wedding planners, I knew I would enjoy it. And I did! Yeah, the book was a little predictable, but maybe that’s just because I’ve read so many of Sarah’s books this year, I could see in advance where she was going with the story. But, that didn’t make me love it any less, as I was hooked as I turned the pages. This book made me laugh so many times, and had quite a few swoon-worthy moments, and even broke my heart in some places, but I loved it nonetheless. I can’t wait to read it again. Overall; Once and For All is a most perfect summer read, and I’m so glad to have finally had a chance to read it. It definitely gave me all the feels. And, now that I’ve marked it off my TBR, I can officially say that I’ve read ALL of Sarah Dessen’s books! I’m really looking forward to rereading a few of them again soon. Sarah Dessen's books always leave me with a smile on my face. Although they do get a little repetitive if you read them all in a row. I haven't read one in forever, and this sounds like such a sweet read. Great review! I really enjoyed this one as well! I agree that it's a great summer read. I am so impressed that you've read all of her books. I still need to read two I believe. Hopefully some day soon! Great review! Hopefully I will get the chance to read this book soon. I heard only good things about it.